Fela and the Kalakuta Queens is the reincarnation show of the late maverick music maestro, Fela Anikulapo. Here was, (indeed, is) a redoubtable man, and perhaps spirit, who singlehandedly defied and shamed the military and civilian establishments, with his fiery personality, unrelenting yabis, music and lifestyle, along with his many women-turned-wives (27 of them) and came out on top. 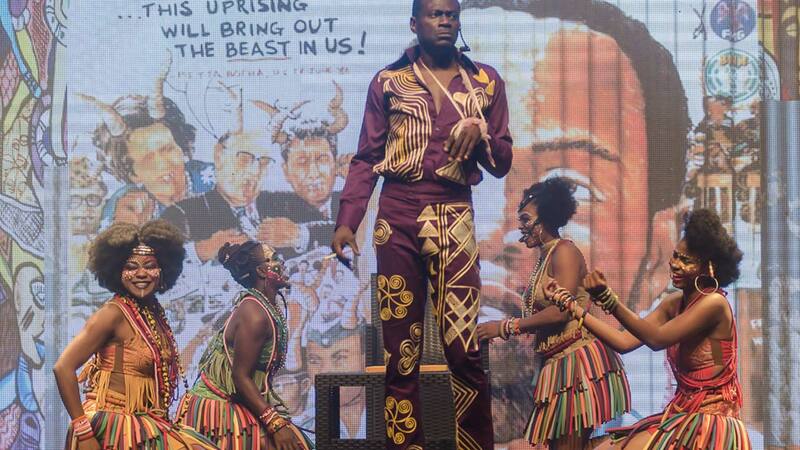 Performed by ‘Laitan Adeniji Heavywind, Fela could not have had a better incarnate portraying him. And Bolanle Austin-Peters (BAP) Productions also outdid itself to create the ambience of Fela’s Afrikan Shrine. Entering into the tunnel that leads into the theatre is a realistic recreation of the iconic shrine of Fela. After 20 shows, BAP Productions has extended the performance dates by four more shows to this weekend ‘by popular demand’ to give Lagosians, who haven’t seen the show, another opportunity before the Christmas and New Year holiday production phase ends. In Fela and the Kalakuta Queens is a reenactment of life at the boisterous household or commune of Fela. With Fela’s daughter, Yeni, one or two of Fela’s wives and a few others who knew Fela firsthand helping out in coaching Adeniji Heavywind and the girls, what comes across is as close a realistic portraiture of Fela as can possibly be done. Fela’s is a household of laughter and pranks, of the women constantly scheming for Fela’s attention to share his bed. 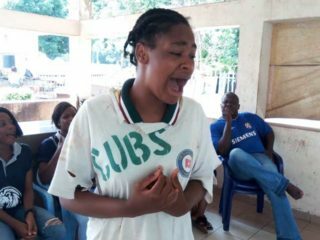 But it is also more than these; it is a household of hard work and Fela is the disciplinarian, who instills hard work ethics on his women and paid them for it. But above these also, it is a household of suffering. Fela is the ultimate one-man opposition squad to the powers-that-be. Government and those who subvert the system hate Fela with a passion. In fact, it is the scene that opens the show. Fela bursts in when two of the women are bickering over soap and almost comes to blows. He sets up court, as is his fashion, and finds lawyers for both women; he declares both of them guilty and pronounces sentences on them. They are not to come near his much-prized bed, fondly called ‘Felacondo’ for a period of time. It is perhaps the mainstay of Fela’s mystique for the women; it is the worst pariah to suffer. And so ‘Thief thief’ song ensues from this trial, with the dichotomy between the common thief and the ‘bigman’ thief being acted out. While the poor man who steals ordinary bread to stave off hunger is heckled and mobbed, the rich thief is in his air-conditioner office busy stealing the people blind and getting away with his loot; the people become the worse for his thievery that is of epic proportion. The show ends with the favourite song, “Water no get enemy,’ as if the man who dared mighty forces decided to make peace for once. According to her, the production experience has been nothing but “amazing” as she has “never done anything so hectic. This is a true-life story where we have to recreate true-life personalities. You have to deliver 150 per cent. 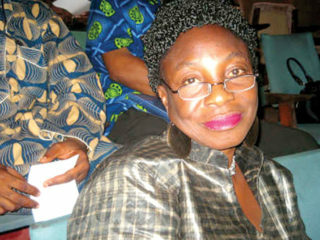 Although a dancer, who doesn’t see herself as an actress, Olunloyo confessed that “it was a great opportunity to play a big role” in the Fela project. She has been in past BAP Productions like Saro and Wakaa, which also had the same set of women performers in them. And she said it has been easy for them to fit neatly into the Fela and the Kalakuta Queen project. Also, the dancer is full of praises for ‘Fela,’ Adeniji Heavywind. Although a jazz musician, who plays the saxophone like Fela he is also coming into acting for the first time. She noted she was yet to work with a more professional artist like him. 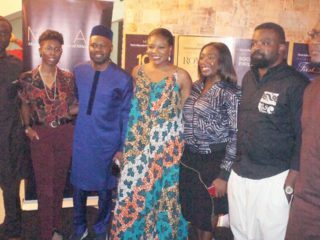 She stressed the focus of the performance, noting that it really should be seen from the standpoint of Fela’s women, who were demonised as prostitutes and ostracised by family and friends for their unconventional lifestyle in consorting with an equally unconventional man. And Olunloyo said, “I won’t lie to you, it was all crazy, but you can’t judge them. They were comfortable being with Fela. It was the only lifestyle they knew. Fela was their father, teacher and mentor. He taught them about hard work, the consequences of action; he shaped them. It was dodgy but they liked it. Olunloyo has Bailamos Dance Company based in Lekki, Lagos; she has done stage productions like Pain, Passion and Pleasure and Fight. Although she is looking to do more productions, she said she couldn’t do so without support, and noted that sponsorship is still a major headache for stage production activities in the country.